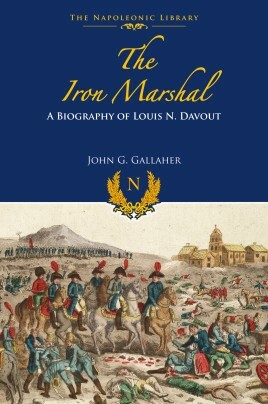 This is a reprint of the meticulously researched biography of Louis N. Davout by John G. Gallagher. It was first released in 1976. Fortunately for us it is a very good book for the simple reason that it is really the only biography in English of this Marshal of France. This is pretty astounding given that only one other Marshal under Napoleon, Massena, would be close to or in Davout's class as a general. Unfortunately for Napoleon, he relied less and less on Davout's generalship in the First Empire's waning years. One can only imagine what would have happened in 1813-1815 with a large amount of troops under Davout's command. Ah well, history is filled with what ifs. So how does the book rate as a biography? Please follow along and find out. The author starts, as usual, with the family of the biographical subject. He then continues with what is known about his birth and early years. Davout is shown to be a child of a family that was not rich, but was certainly more well off than most Frenchmen of the time. He is shown to have joined the Royal Army after a stint at the Ecole Royale Militaire at Auxerre, and the military academy in Paris. Even after the outbreak of the French Revolution in 1789, his life still continued in the same manner for a short while. That all changed in 1790. The author shows that like all the other people of France, he had to pick a side: King or Revolutionary Government? Like most, Davout chose the latter. Gallaher informs us that instead of this being a calculated move on Davout's part, it was a choice made in Davout's heart. We must remember that even though Napoleon created himself emperor, most of the laws and ideals that had occurred because of the revolution were still in place. This is something that is sometimes forgotten about when we discuss ex-revolutionary generals etc, who backed and actually supported Napoleon's rule. The author continues with Davout's life and tale through the early years of Napoleon's rise, with Davout also rising to become a Marshal of France. Unlike most of the other Marshals, Davout only increased his military skill with higher commands. The book goes on to relate his important role at Austerlitz, and his amazing victory at Auerstadt. His life is continued through the apogee and descent of the First Empire. The book is written almost too well. The author really only places the facts upon our plate. You will find bits and pieces about how Davout got on with Napoleon and the generals and soldiers under his command. These are all based on written records. What you will not find is the author coming to his own conclusions about incidents in the Marshal's life. The book should be a boiler plate for other biographers. If it is missing one thing, it is the author's own assessment of Davout as a military leader compared to the other Marshals. However, given the way it was written, one could hardly expect it. I just wanted to see if my ideas matched the author's. Thank you Frontline Books and Casemate Publishers for the chance to review this not only wonderful, but needed book.